Tue., Sept. 20, 2016, 9:54 p.m.
Tim Tebow says he’s just trying to get better each day in the New York Mets’ instructional league in Port St. Lucie, Florida. After two days, so far, so good. 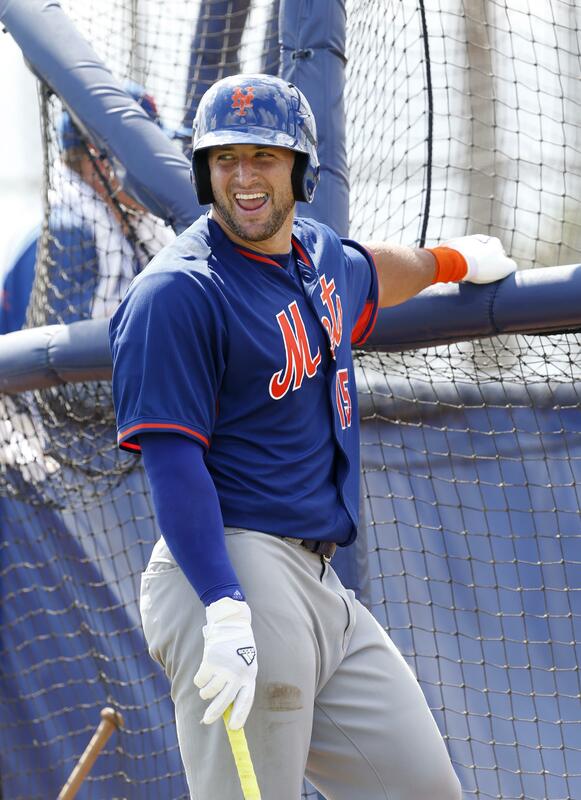 Tebow homered to right during batting practice on Tuesday, one day after the quarterback-turned-baseball-hopeful put three balls off the fence at the Mets’ training complex. Commissioner Rob Manfred is confident Major League Baseball teams fully disclose medical records, but said his office has demonstrated that it will use discipline as a way to discourage rules violations. Manfred’s comments during an appearance in Texas on Tuesday came less than a week after MLB suspended Padres general manager A.J. Preller for 30 days without pay for his actions in the Drew Pomeranz trade to Boston. “I think the penalty speaks for itself,” Manfred said. Steven Matz is heading back to New York, with plans of getting into the Mets’ postseason chase by the weekend. The left-hander, who hasn’t pitched for the Mets since Aug. 14 because of tightness in his throwing shoulder, went through a long-toss workout at the team’s facility Tuesday. He planned to leave for New York later in the day, with expectations of throwing a bullpen at Citi Field on Wednesday. If all goes well there, the Mets could start him Friday against Philadelphia. The New York Yankees have reinstated outfielder Aaron Hicks from the 15-day disabled list and inserted him into the lineup for Tuesday night’s game against Tampa Bay. Center fielder Jacoby Ellsbury didn’t rule out starting Wednesday night. He bruised his right knee Saturday at Boston. Cubs right-hander Pedro Strop is set to be activated off the disabled list Friday, solidifying Chicago’s bullpen for the playoffs. Strop threw about 20 pitches without difficulty in a simulated game Tuesday. … Pittsburgh Pirates catcher Chris Stewart had arthroscopic surgery on his left knee and is expected to be out six-to-eight weeks. … The Detroit Tigers kept second baseman Ian Kinsler and designated hitter Victor Martinez out of the lineup at Minnesota after both were injured when being hit by pitches in their previous game. Published: Sept. 20, 2016, 9:54 p.m.